This article was made with support from Participant Media, the creator of An Inconvenient Sequel: Truth to Power. Paulette Richards has lived in Liberty City for almost 40 years. In that time, the 57-year-old community organizer has seen some things in the close-knit and vibrant historically black community, located in northwest Miami-Dade County. She’s seen young mothers struggle to feed their babies despite working multiple jobs. She’s seen kids suffering because of a lack of resources. But recently, there are some people she hasn’t seen—some of her former neighbors and friends. “I can get emotional even thinking about it. Where is such-and-such?” she told The Root recently. Like many predominantly black communities across the country, Liberty City is experiencing a rise in gentrification. But in the case of Liberty City and some other black Miami neighborhoods, gentrification may include another interesting factor: climate change. The idea of climate gentrification expands upon traditional gentrification by focusing on environmental issues, such as rising sea levels, as key factors in driving out, and oftentimes pricing out, those situated in areas that were previously deemed less valuable. In the first of a three-part series, The Root will be exploring the ways in which race, climate and gentrification intersect and impact black communities in Miami. Richards became especially passionate about climate gentrification years ago while on a trip to Washington, D.C., to discuss environmental issues with government officials. Unfortunately, conversations surrounding climate change and rising sea levels are not being had in her neighborhood. She says that residents are focused on more immediate needs like affordable housing, jobs, transportation and safety. “They don’t have time for climate change. It’s at the bottom of the totem pole,” she said. Liberty City was the backdrop of the recent Oscar-winning film Moonlight,which showed the oftentimes harsh realities of growing up in the projects, while also humanizing the lived experiences of those in the community. The area’s current median income is little over $26,000. Nonetheless, while Liberty City may be less fortunate in some areas, it is incredibly valuable in others, especially considering that it sits 10 feet above sea level. Compare that with Miami Beach, where the median income is $164,000 and is approximately 5 feet above sea level. Higher ground becomes essential—and more valuable—as coastal communities in the United States battle chronic flooding as a result of rising sea levels. A recent study showed that while 90 coastal regions in the U.S. are currently dealing with chronic flooding, that number is expected to increase to 170 communities in less than 20 years. Although sea level rise is a naturally occurring phenomenon, George Eberli, a professor at the University of Miami who specializes in sea level changes, says that the acceleration is alarming. Higher ground becomes essential—and more valuable—as coastal communities in the United States battle chronic flooding as a result of rising sea levels. That means that areas in Miami situated on higher ground will have a major advantage as coastlines flood and people seek safer and more affordable alternatives. These issues are what drove Richards to try to increase awareness and engagement surrounding climate change in her neighborhood. She first planned a climate change art contest to see what kids in her area knew about the subject and to pique their interest in order to get conversations started in their homes. She also had the idea to create a “Climate and Me” summer program for the young people in her neighborhood and saw that as a good opportunity to further disseminate information on climate change. Since 2010, professor Hugh Gladwin, an anthropologist who studies South Florida, particularly as it relates to disasters, hurricanes and the environment, has mapped out (pdf) sea level rise and its potential environmental and social justice effects. Gladwin and his colleagues at Florida International University have also been looking closely for evidence that properties situated at higher elevations in poorer neighborhoods are pushing out tenants. Though he has noticed some hot spots in Liberty City where high-elevation properties have been bought, he says it is difficult to state conclusively that it is solely because of climate-based gentrification. “Or is the market still being moved by the crazy South Florida cycle?” he said, where investors are just simply looking for a good deal. What he does believe is that “Miami is not going to be here in any form that it is right now, 60 to 100 years from now,” depending on how state officials deal—or don’t deal—with climate change. But while politicians debate whether climate change is real or a hoax, other people are taking advantage by investing in property on higher ground. Peter Ehrlich is an investor with almost 4 acres of property in some of Miami’s higher-elevated locations, including Little Haiti. Though he says he didn’t initially consider sea level rise as a factor when he began purchasing property in the 1990s, he’s now more aware of its benefits. “Since the ’90s, we’re a lot more cognizant of sea level rise and the flooding that we see a lot more often,” Ehrlich said. Some see parallels in Miami to what happened to the predominantly black Lower 9th Ward in New Orleans after Hurricane Katrina. While the flooding after the levies broke destroyed property, it was the displacement of the 9th Ward’s residents that continues to have a lasting impact as white millennials move into the area, driving up real estate prices. That’s a very real fear La Tonda James has for at-risk areas in South Florida. “Hurricane Katrina came in and decimated neighborhoods. My fear is that the history of black folk will be eliminated,” she said. James, a community-building specialist for Neighborhood Housing Services of South Florida, serves as a conduit between people in the community and experts who encourage them to get educated on issues they face. Whether or not the residents are formally educated, climate change has to be presented as something that’s important, James said. And it’s not just in Liberty City—other areas in South Florida are feeling similar impacts when it comes to gentrification. 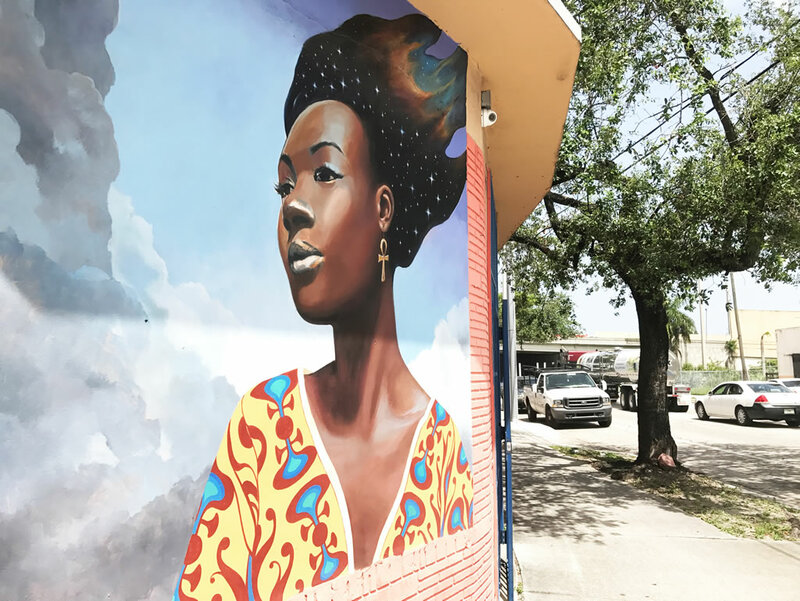 “We are in the last phase of gentrification in Little Haiti,” said Marleine Bastien, the executive director of Fanm Ayisyen nan Miyami (Haitian Women of Miami), an organization that works to meet the needs of low- to moderate-income Haitian women and their families. “We believe that the locals or immigrants who sacrificed so that they could build their own communities should have the right to live in their communities,” Bastien said. The colorful and cultural Little Haiti, which also sits about 10 feet above sea level, was established as a refuge for Haitians seeking asylum from the Jean-Claude Duvalier dictatorship in the 1980s. The area is currently 75 percent black, but the number of Haitian Americans is diminishing “due to urban renewal and gentrification of surrounding areas,” according to a 2015 study (pdf). Little Haiti’s white population has increased 54 percent (pdf) since 2000. Nonetheless, Bastien said that she will continue fighting to maintain the legacy of Little Haiti. “This [neighborhood] is a story of people who were disenfranchised and fought back,” she said.